It’s time to knock the dust off the carriages, and start shedding out those ponies! With that in mind, I’ll be hosting a “Spring Tuneup Camp” in East Bridgewater, MA April 13th – 16th. This will be a great way for people to kick-start the season. The camp will be a combination of discussions, private, semi-private and group lessons. 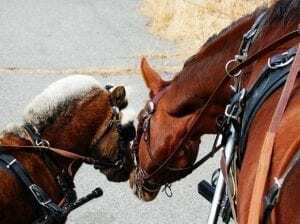 We’ll cover elements of combined driving and general training techniques that can be applied to any type of carriage driving. You’ll also get a guided course walk of cones and hazards with discussions on strategies for driving them. Auditors will have the opportunity to participate in the discussions, and learn by watching the lessons as they happen. Auditing will cost $25 per day. Save $20 by signing up for all 4 days. Just use the discount code: “4-day pass” when you sign up for 4 days. We have a covered arena to work in, so the camp will be rain or shine (let’s hope for shine!) Bring your lunch, or get lunch locally at one of the many local sandwich shops or restaurants locally. 4:00 – Scores, Review, and Wrap-up. REGISTER TO ATTEND AS AN AUDITOR HERE!